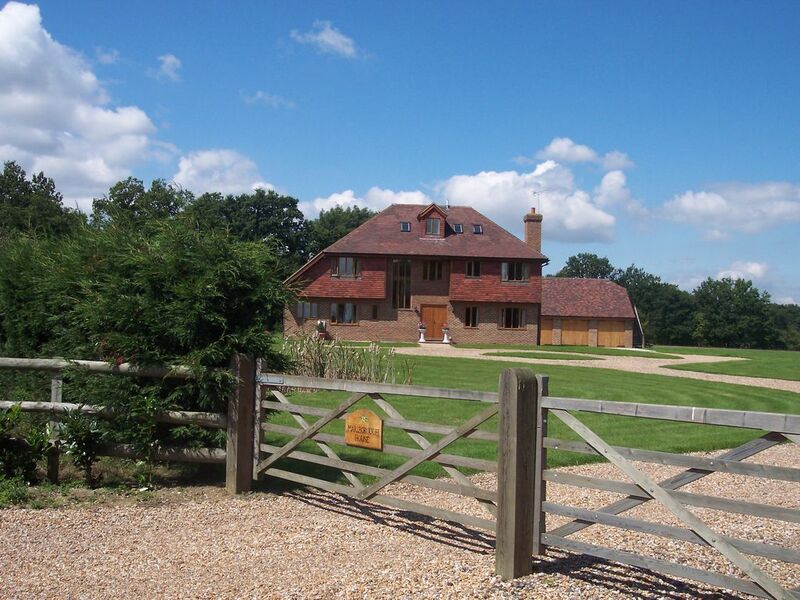 7 bed Great location.Views.Detatched.Rural yet easyaccess amenities and London. Tudor style , modern and attractive farmhouse , with wedding package option, in rural Kent near Tenterden, Close to London, with plenty of parking, wi fi, situated in one acre of lawned gardens, (mostly unfenced) in the heart of the countryside , amongst the trees , rabbits , birds and local wildlife, surrounded by our own fields, with pond (unfenced) and access to more. Sleeps 14-16. Add our additional annex close by to sleep 20-24. Price note: 3 night weekends ( FSS) or 4 night weekdays (MTWT) available at 75% of the full rate. Token discount available for those who can only stay for two nights so a manual price is necessary. Or see our website, largekentholidayhome. Easy access London , M20 (10 miles) local stations(s) and all airports. Private rural location, quiet country lane, yet close to small villages with shops, pubs, post office, doctors and supermarkets, lots of great restaurants and old English pubs. Ideal central Kent location. Tenterden 3 miles. Ashford 10 miles, M20 motorway 10 miles , Easy access to attractions. Large lounge, dining room for 12 - 16 , separate additional dining room, great well set out and equipped kitchen, separate fully equipped utility room, 7 bedrooms plus facility to add beds to create family rooms sleeping additional numbers. Plenty of bathrooms. Downstairs WC. Flatpanel TV Freeview, DVD, additional TV s and DVD s, Football Table. Games and Toys to keep you occupied, high chair , stair gates, and cot(s) on request, Internet Access ( Rural) . Two patios, with plenty of outdoor seating, barbeque with gas, lots of outside space for football and games, (supplied).Surrounded by its own fields and ponds. Excellent location for country walks and cycle rides throughout the weald, from local footpaths, and the bridle path at the end of the drive to the well documented pilgrims way. Ideal family get together. Child friendly. Notes: No pets, smoking indoors or fireworks. Close to many popular golf courses, course fishing locations, local vineyards, hop gardens, and many local attractions, as well as shopping, old English pubs, many excellent restaurants of most styles, and take aways. Or ask regarding, Concierge, housekeeping , cook , security incl. Local coarse fishing , Cackle Hills , Biddenden, plus Bethersden Carp Lakes, Cranbrook, Bewel water and Lydd for water sports or the sea is only about 20minutes drive. Tenterden Steam Railway, Romney Hythe and Dymchurch miniature stream railway, Vineyards: Biddenden , Chapel Down Tenterden plus more. Woodchurch Rare Breed centre, Port Lympne Zoo, Howletts wildlife park. Beach at Camber sands, Dungeness nature reserve, Bedgebury forest and Pinetum, Sissinghurst, Leeds and Dover Castles, Cantebury and Rochester Cathedrals , many more historic houses and gardens. Spa (s) close by , or for the energetic , local quad biking, archery, clay shooting and more , perhaps try Skydiving from Headcorn . History : Tenterden , Rye, Canterbury, Rochester and more. Pubs and Restaurants: Huge variety all within One - ten miles. Stay in a beautiful country Location yet close to amenities and attractions. A few examples: Places to visit : Sissinghurst, Leeds and Dover Castles, Cantebury and Rochester Cathedrals, Tenterden Steam Railway, Romney Hythe and Dymchurch miniature stream railway, Vineyards: Biddenden Vineyard, Chapel Down Tenterden vineyard plus more.Woodchurch Rare Breed centre, Port Lympne Zoo, Howletts wildlife park. Beach at Camber sands, all within about 20 minutes drive. History : Tenterden , Rye, Canterbury, Rochester and more. Pubs and Restaurants: Huge variety all within One - ten miles we supply a list ! Shopping: Tenterden is 3 miles or Ashford town is ten miles offering a MC Arthur Glen Designer shopping outlet, Try Tunbridge Wells, and several other Local Towns, or why not take a trip to Lakeside and Bluewater about an hour away, high speed and International rail links, High Speed to London 35 min and Paris, or take the ferry across the channel for the day Fishing and waterspouts : Local coarse fishing , Cackle Hills , Biddenden, plus Bethersden Carp Lakes, Cranbrook, Bewel water and Lydd for water sports or the sea is only about 20minutes drive. Master en suite has: spa bath, double cubicle power shower, basin, WC. 2nd en suite has electric shower over bath, basin, WC. 3rd en suite has quadrant shower cubicle, basin, WC. Family bathroom: double ended bath side taps include shower for hair rinsing, basin and WC. Kitchens all fitted out, and well equipped, toasters, kettles, tea, coffee, coffee machine, ovens/ grills, one dishwasher, microwaves, washing machines, tumble dryer, Mixers, blenders. Stay in a beautiful country location yet close to amenities, attractions and transport links. Add our wedding , glamping and events packages, use the garden or field for larger events , basic blank canvas or full package available to cater for up to 40 or up to 120 ask for full details . Our family of 11 spent 10 days at this beautiful property and were pleasantly surprised at how comfortably we all fit. Tony, the landlord, met us on arrival and gave us lots of useful information/brochures about things to do and dining in the area as well as being available on short notice if we needed anything. The house had 3 floors with 7 lovely bright bedrooms. 4 of the bedrooms had double/queen beds, one of which also had 2 extra single beds and another, clearly the master bedroom, had a large king bed. 3 of these 5 bedrooms had en-suite bathrooms. There were also another 2 bedrooms, each with a large single bed and a regular single bed. There was another full bathroom on the 2nd floor and a toilet on the ground floor. The house was warm, welcoming, clean and fresh with a well-stocked kitchen and everything you could need. The BBQ came in handy a couple of evenings along with ample seating for eating, both indoors and out. There were 3 British sized refrigerator/freezers, ovens and a microwave, laundry facilities and the living room was comfortable with 3 large couches and chairs which all made for a perfect place to relax with family after long days of touring the Kent area. We could not have asked for more and would highly recommend this property to others. Lovely house and spacious grounds. The extended family visit was a great experience for all - 8 adults and 4 children we all enjoyed it. The host could not have been more helpful and accommodating, and he provided us a with a great "welcome pack" of goodies to get us going. The surrounding area is amazing: we especially relished the trip to Hastings to see the dinosaur footprints and to Bodiam Castle. The walk into the village was a bit difficult using the footpath. House is in a very peaceful location, but loads to do within a fairly short drive. Most bedrooms are a good size although the two at the top have sloped ceilings. Spacious living room, well equipped kitchen and the arrival welcome pack was a lovely touch. We had a fabulous weekend at Marlbourough House (Woodview Farm) which we booked for a family birthday celebration. Our party consisted of 9 adults and 3 children, aged 15,12 & 11.The accommodation was spacious, very well equipped and very clean. We couldn’t fault it in any way. There was also loads of outdoor equipment to keep us all amused in the very spacious grounds. Tony the owner is a great host and was always on hand if we needed anything. We particularly appreciated the welcome pack which was very generous. It clearly matters to Tony that his guests have a great time because in most respects he exceeds expectations. We would definitely go back and are happy to recommend it. We would also recommend the catering service, Passionate Foods, which Tony recommend. The service and food was excellent. Beautiful rural location, surrounded by fields, quiet country lane, yet close to small villages with shops, pubs, restaurants, post office. Ideal central location. Tenterden 3 miles. Ashford 10 miles. Coarse fishing on site and all around. Vineyards Golf, surrounded by local walks and footpaths, castles and gardens, Wildlife parks Zoo , Paintball, Quadbikes, Go Carts, all reasonably close. Golf: Golf: Chart Hills by Nick Faldo, Biddenden is just 3 miles through the lanes, London Beach 2 miles, Tenterden 3 miles, Weald of Kent Headcorn, Homelands Kingsnorth, Hempsted Forest Cranbrook, Hawkhurst, Leeds Castle. Dale Hill Wadhurst, or try Biddenden for local pitch and putt or Sandwhich and Littlestone further afield. On confirmation of booking 50% of rental is due, then remainder due 4 weeks prior to arrival. Security deposit of £200. due on arrival to cover damages should there be any, we anticipate a full refund of £200. without any little accidents. Prices are for 14 Guests in the Farmhouse, we can sleep up to 24 at additional cost. 3 night weekends ( FSS) or 4 night weekdays (MTWT) available at 75% of the full rate. Note we may need to manually confirm bookings. Winter heating surcharge 1st October - 30th April: £15.00 per night. Bank holidays full week 14 Guests £1800 24 Guests £2720, 5 nights 14 £1500 24 £2380 3 nights 14 £1350 24 £2040 (excl August Full week £1950 £3120) Christmas Flexible arrival.Full week 14 £2750 24 £3950. NYE as Christmas. Wedding reception , group glamping and or event / corporate options available, on site or nearby, at additional cost, blank canvas add your own facilities or use ours; for up to 40 from £600 up to 120 from £1800. Ask for details. We recommend guests take out travel insurance to cover any eventualities.